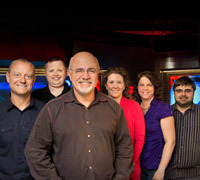 The Dave Ramsey Show team (L to R): Blake Thompson, Zack Bennett, Dave Ramsey, Lara Johnson, Kelly Daniel and Matt Aaron. What were you doing 20 years ago? Starting kindergarten? Hanging out in high school? Getting married? Having your first kid? The Dave Ramsey Show was born 20 years ago. And though it started small, the show has grown into one of the most successful radio shows in America. To celebrate The Dave Ramsey Show’s 20th anniversary, our writing team interviewed Dave and his producers to craft a series on the show’s history. These five articles highlight many of the reasons The Dave Ramsey Show has become what it is today. Take a look at this exclusive content for an insider’s take on The Dave Ramsey Show’s rich history. The team remembers some of the more memorable callers in the history of The Dave Ramsey Show as well as some impressive numbers that highlight the show’s impact over the last two decades. Read more. Everyone knows Dave, but who are the people behind the scenes that make The Dave Ramsey Show tick? And how do they help the show reach millions of listeners every day? Find out how Dave, Blake, Lara, Matt, Zack and Kelly work hard to bring the show to an audience of more than 5 million listeners. It all started at a small studio in Nashville. 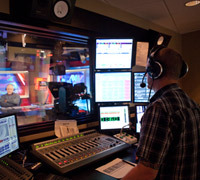 Fifteen years later, The Dave Ramsey Show is broadcast to more than 500 stations every day. Here’s how it happened. Dave’s studio in Nashville is pretty fancy these days, but the first few studios were makeshift, do-it-yourself projects. Dave and his producers relive some of the early days filled with faulty chairs and cold pizza. Read more. What’s next for The Dave Ramsey Show? What does Dave expect the show to look like in 10 years? Dave and his team members take a look at what the future might hold. Without you, The Dave Ramsey Show wouldn’t be what it has become. Thank you for tuning in every day and giving us the opportunity to share these memories with you! What are some of your favorite memories from The Dave Ramsey Show over the years?